Note: while I try not to insist on expensive ingredients unless absolutely necessary, I would urge you to use the best cocoa powder you can find (Valrhona is my favourite) and using medjool dates for these brownies – these dates are wonderfully soft and give the brownies their soft texture as well as their sweetness. 1. Start by grinding 60g of the roasted hazelnuts in a food processor – you want to stop just short of the hazelnuts turning into a meal. Roughly chop the remaining hazelnuts. 2. Chop the medjool dates finely and add to the ground hazelnuts with a pinch of salt. Pulse until the dates, ground hazelnuts and cacao come together in clumps and the mixture is starting to look a bit shiny (a sign the oil is starting to separate from the hazelnut solids). Take a small amount of the mixture press together between two fingers – if the mixture is soft and keeps its shape and does not crumble, the brownie mix is ready, if not pulse a few more times. 3. 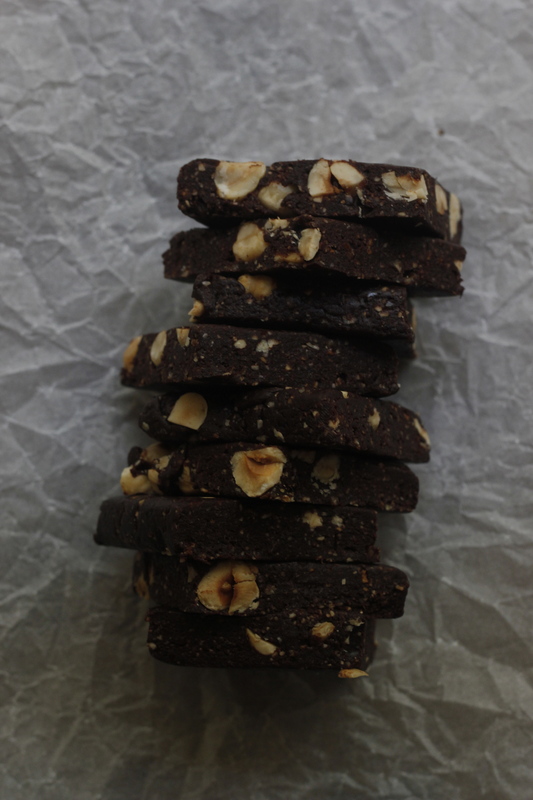 Drop the brownie mix on a piece of parchment paper and scatter the chopped hazelnuts on top. Knead the mixture until the hazelnuts are fairly evenly distributed. Add additional salt to taste. Cover mixture in clingfilm and gently squash into a 15x15cm square. Place in the fridge for 30 minutes to firm up. 4. Using a sharp knife cut square into 9 small brownies. 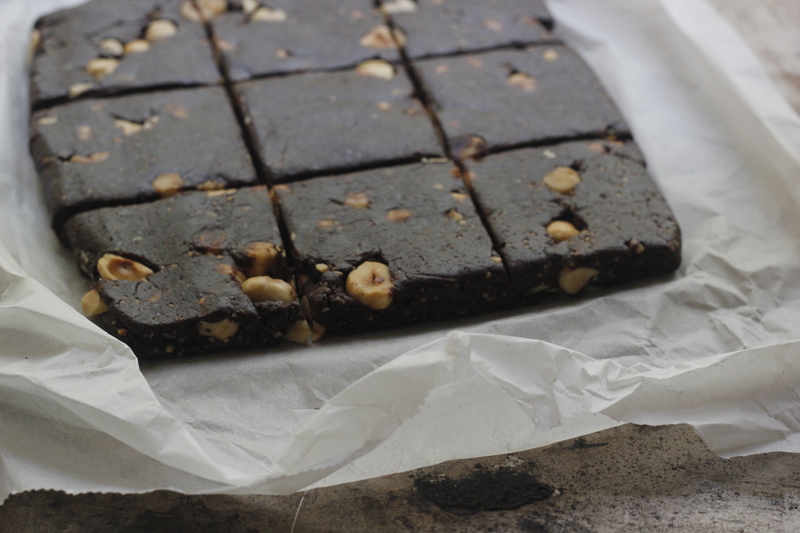 Wrap each brownie in parchment paper or clingfilm and store in an airtight container. You tease! 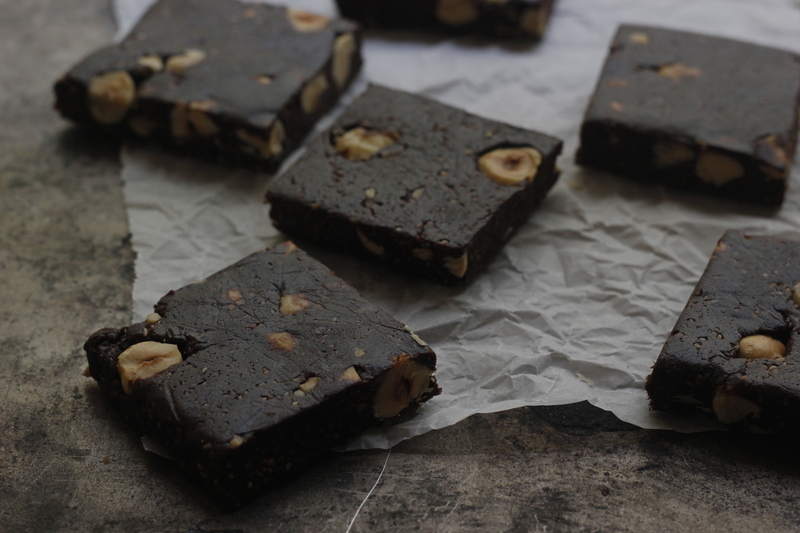 Here I was, hoping for a brownie… Kidding, I have way too many brownie recipes anyway, love the look of these dark hits of chocolate. Have a fab holiday! I know, I felt a bit cheeky calling them brownies although texture and flavour-wise that is what they are closest too! Your trip sounds so wonderful and something I hope to experience someday as well! Love everything about it, the scenery, the fresh air, the friends and of course your date brownies would be the perfect snack to take with! Thank you – it really is wonderful and I so appreciate the years we manage to head to the mountains for a week during winter. It is so rare we spend this much time outdoors completely disconnected from everyday stresses. The perfect way to recharge our batteries! These look really good – you can never have too many brownie recipes and this one certainly looks a lot healthier than many recipes I’ve tried. I hope you have a fabulous time on the slopes! Thanks Kezia, and yes, one can never ever have too many brownie recipes! YAY for skiing! I’ve only been skiing in North America and never in Europe — I can only imagine how very gorgeous the Alps must be. Hope you have (or had) a wonderful trip. 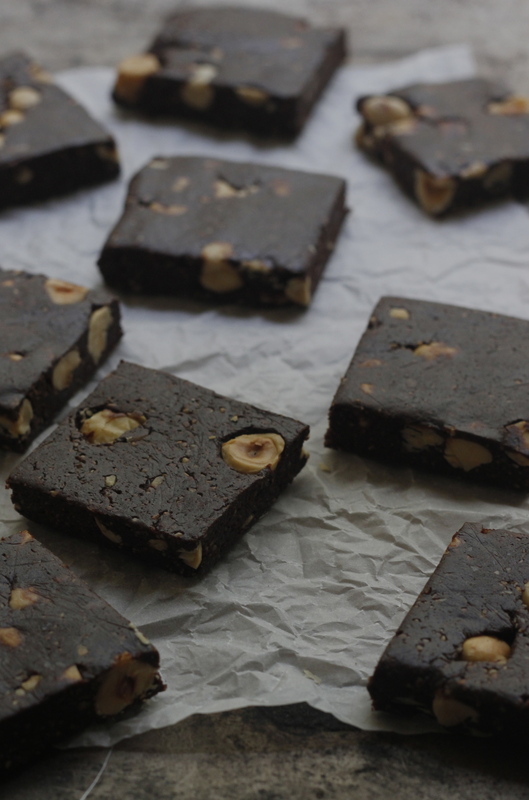 These brownies look so dense and decadent — I’ve been meaning to try dates in raw desserts but haven’t gotten around to it yet! You’re inspiring me to try! Hah, I had a similar thought the other day – having only ever gone skiing in Europe I always wonder what it’s like skiing in North America, the landscape, the architecture, the food, the drinks etc.